The Amalgam Submersible UV 40 watt are the most effective form of uvc to date ! The Air Aqua Amalgam provides radiation with a wavelength of 253.7nm which is generated by the special light source UV lamp, Ensuring a lethal effect on bacterial. The Amalgam UV radiation neutralizes bacteria, viruses and other primitive organisms, stopping them form multiplying. The unit has a built in high frequency electronic ballast which absorbs current fluctuations and protects the lamp inside the unit. The Amalgam Submersible UV 40 watt lamp is not affected by temperature fluctuation in the water and generates a constant powerful output and is know as being the most powerful uv-c on the market ! Evolution Aqua Evo UV 55 watt, It has to be said they look really impressive. The styling of the new models has a contemporary look, and they will sit perfectly alongside Evolution Aqua’s current range of filters, complementing them for style and quality. Evolution Aqua have been developing a brand new range of ultraviolet lights, named the evo UV. 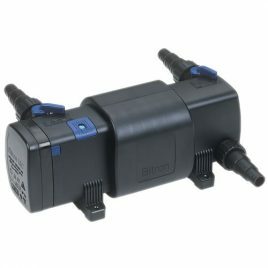 They have been met by a genuine sense of excitement amongst aquatics dealers, and we are sure that once Koi keepers and water gardeners see the evo UV's for themselves, they will be impressed too! There are 5 Evo Uv that are in the range. The Evo 15, Evo 25, Evo 30, Evo 55 and Evo 75. 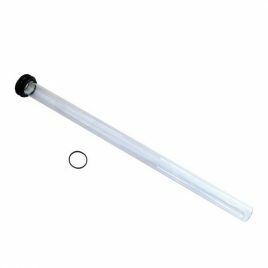 This broad spectrum means that many pond owners will be able to add the new UV's into their current set-ups. Evolution Aqua’s Evo UV 55 will be the perfect solution for pond owners looking to eradicate green water. One of the major benefits of Evolution Aqua’s evo UV range is the build quality, as they will be manufactured from the same polymer as used on the tried and tested Nexus, Eazypod and Cetus. This means that this hard wearing UV stabilised PE will offer a higher reflective index than a stainless steel body and will ensure that the bulbs and ballast are securely protected. All new professional UV clarifier range. The new Evolution Aqua evo UV deliver a more efficient and more economical performance than before thanks to their new design. The new range includes completely redesigned 30 Watt and 55 Watt models, a new 15 Watt and 25 Watt model perfect for use on the smaller garden pond, along with a 75 Watt version. 5 models including a 75 Watt UV The top end 75 Watt model is designed for ponds up to 75,000 litres. The highly efficient ballast and high output 75 Watt UV bulb provides a more economical option than a traditional 110 Watt UV due to the greater UV contact time offered by the 1.2 metre bulb – ultimately saving you money! The evo UV pond clarifiers are manufactured in house by Evolution Aqua, continuing our long tradition for manufacturing exceptional pond filtration equipment right here in the UK. More efficient design The design of these new UV's optimises flow rates and improves energy efficiency, with the sole focus to deliver optimum performance at all times to clear green water in ponds which is caused by single celled green algae. evo UVs will work alongside many different filtration systems and are incredibly easy to install with flexible hose or hard pipe and can be easily fitted within existing pipework runs. 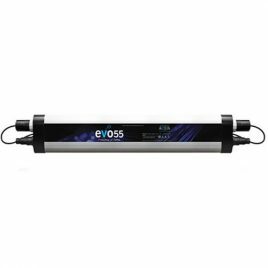 Evolution Aqua Evo UV 55 comes with a high output UV bulb powered by energy efficient ballasts, all housed within a fully watertight, robust housing. 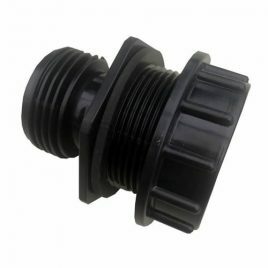 32mm Connector for Amalgam Submersible UVC Mounting This is a great simple way to install your Amalgam Submersible UVC simply drill a 48mm hole in the desired location, insert the male part of the connector from the outside with the provided rubber seal. then tread the nut on from the inside. Then slide the Quartz tube though the connector from the outside with the O-ring provided with the uvc. insert the bulb, plug in the bulb connector and tighten the locking nut. connector for Amalgam Submersible UVC requires a 48mm hole. The Amalgam Submersible UV 80 watt are the most effective form of uvc to date ! The Air Aqua Amalgam provides radiation with a wavelength of 253.7nm which is generated by the special light source UV lamp, Ensuring a lethal effect on bacterial. The Amalgam UV radiation neutralizes bacteria, viruses and other primitive organisms, stopping them form multiplying. The unit has a built in high frequency electronic ballast which absorbs current fluctuations and protects the lamp inside the unit. 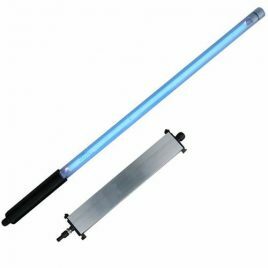 The Amalgam Submersible UV 80 watt lamp is not affected by temperature fluctuation in the water and generates a constant powerful output and is know as being the most powerful uv-c on the market ! Evolution Aqua Evo UV 25 watt, It has to be said they look really impressive. The styling of the new models has a contemporary look, and they will sit perfectly alongside Evolution Aqua’s current range of filters, complementing them for style and quality. Evolution Aqua have been developing a brand new range of ultraviolet lights, named the evo UV. They have been met by a genuine sense of excitement amongst aquatics dealers, and we are sure that once Koi keepers and water gardeners see the evo UV's for themselves, they will be impressed too! There are 5 Evo Uv that are in the range. The Evo 15, Evo 25, Evo 30, Evo 55 and Evo 75. This broad spectrum means that many pond owners will be able to add the new UV's into their current set-ups. Evolution Aqua’s Evo UV 25 will be the perfect solution for pond owners looking to eradicate green water. One of the major benefits of Evolution Aqua’s evo UV range is the build quality, as they will be manufactured from the same polymer as used on the tried and tested Nexus, Eazypod and Cetus. This means that this hard wearing UV stabilised PE will offer a higher reflective index than a stainless steel body and will ensure that the bulbs and ballast are securely protected. All new professional UV clarifier range. The new Evolution Aqua evo UV deliver a more efficient and more economical performance than before thanks to their new design. The new range includes completely redesigned 30 Watt and 55 Watt models, a new 15 Watt and 25 Watt model perfect for use on the smaller garden pond, along with a 75 Watt version. 5 models including a 75 Watt UV The top end 75 Watt model is designed for ponds up to 75,000 litres. 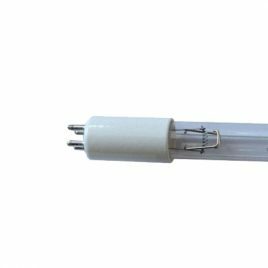 The highly efficient ballast and high output 75 Watt UV bulb provides a more economical option than a traditional 110 Watt UV due to the greater UV contact time offered by the 1.2 metre bulb – ultimately saving you money! The evo UV pond clarifiers are manufactured in house by Evolution Aqua, continuing our long tradition for manufacturing exceptional pond filtration equipment right here in the UK. More efficient design The design of these new UV's optimises flow rates and improves energy efficiency, with the sole focus to deliver optimum performance at all times to clear green water in ponds which is caused by single celled green algae. 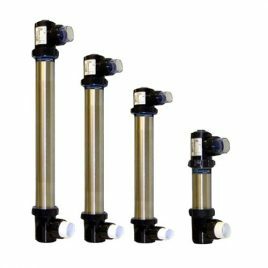 evo UVs will work alongside many different filtration systems and are incredibly easy to install with flexible hose or hard pipe and can be easily fitted within existing pipework runs. 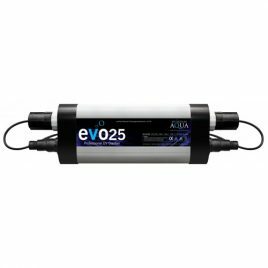 Evolution Aqua Evo UV 25 comes with a high output UV bulb powered by energy efficient ballasts, all housed within a fully watertight, robust housing. Yamitsu Algae Master Pond UV Clarifier 11W Yamitsu algae master uv's are made from UV stabilised materials to ensure a longer life and incorporate turbulators to enhance the unit’s performance. Large inlet and exhaust ports make the algae master uv suitable for a wide range of pond uv applications. It is recommended that the algae master uv should be installed using solid solvent weld pipe. However, all algae master uv's come complete with free (glue in) hosetails enabling them to be connected to ½", ¾", 1", 1¼" and 1½" flexible pipe. Algae master uv's will also fit most popular 1½" household solvent weld waste and pressure pipes. 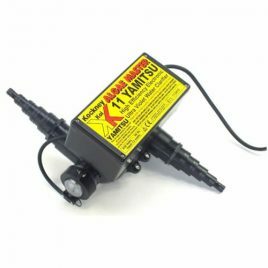 Yamitsu Algae Master Pond UV Clarifier 11w Installation If you have a severe algae problem you should effect a partial water change before starting the installation. Yamitsu Algae Master Pond UV can be added to any existing filtration system. For best results algae master units should be fitted in line, after the pump, with water being forced through them. Use the largest size of pipe possible. If hosetails are to be used, it is very important that they are trimmed to the largest possible size that will fit inside the flexible pipe (before glueing in place). This will ensure that the maximum flow rate can be obtained for the size of pipe. 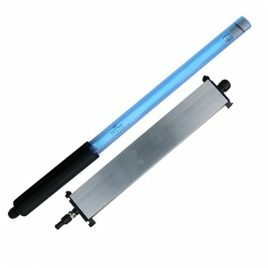 Yamitsu Algae Master UV Maintenance Although maintenance is minimal all UV lamps need replacing at six monthly intervals. The algae master's uv lamp may be illuminated and appear to be working but the radiation dosage diminishes with age and is ineffective after six months. Dispose of used uv lamps sensibly. Even exhausted uv lamps should NEVER be looked at directly when illuminated. 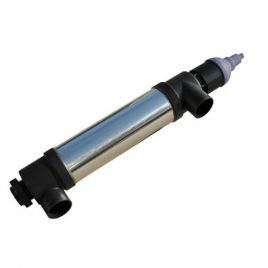 As the algae master uv is dependant upon water passing through it, it is important to ensure that any pump strainers, pre-filters or delivery pipes are not blocked or are causing the flow to be restricted.